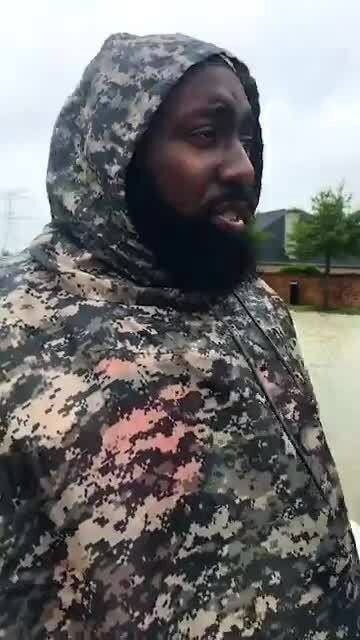 (FreshAsFrankie) Rapper Trae Tha Truth is doing his part to help rescue people, as Hurricane Harvey continues to dump record amounts of rain on Houston. Trae went on a boat ride with Fox 26 reporter Rashi Vats on a boat earlier today (August 29), to survey the flooding and the damage in Houston. According to reports, first responders have conducted over 3,500 rescues since the massive flooding started yesterday. According to The Houston Chronicle, Trae was forced to sleep in his truck, after he was forced to evacuate his home. And even though his truck was soon submerged in water, Trae still took the time to try and help rescue other residents and bring them to safety. “I don’t even know how we prepare for this because there’s water everywhere,” Trae said. Over 17,000 people are currently in shelters, which are filling up fast and over 9,000 people are currently being housed in the George R. Brown Convention Center. On a boat w/ hip-hop artist Trae the Truth.